The owner and chef of L.A.’s famous and successful La Brea Bakery reveals her magical recipes, adapted for home bakers. Before the baking even begins, Silverton takes the reader through the wonder of bread alchemy, then introduces readers to a wide range of recipes which range from the whimsical to the sublime. Chef Nancy Silverton began her delicious career in Sonoma, California, where she started working in a vegetarian kitchen in her college dormitory. After discovering cooking was her passion, she decided to pursue an “official” culinary education, and enrolled in Le Cordon Bleu cooking school in London, England. Graduating with a solid foundation in culinary arts, Silverton returned to the states to begin working at Michael’s restaurant in Santa Monica, CA under Jimmy Brinkeley. It was there that Silverton discovered her passion for pastry and returned to Europe to attended Lenotre Culinary Institute in Plasir, France to perfect her skills. Upon returning to the states Nancy was invited by Wolfgang Puck to be the head pastry chef at his world renowned southern California restaurant, Spago. In June of 1989, Silverton opened the restaurant Campanile with partners Mark Peel and Manfred Krankl; an institution that all Angelenos cherish to this day. When developing the restaurant menu and sourcing premium ingredients and vendors, Silverton soon realized that the same bread she tasted and studied in Europe was nowhere to be found in Los Angeles. In fact, there was no authentic artisan bread in all of Southern California. Longing to serve a crisp crust and soft airy interior, with the tang of an all-natural sourdough starter, Silverton began teaching herself the ancient art of sourdough bread baking. 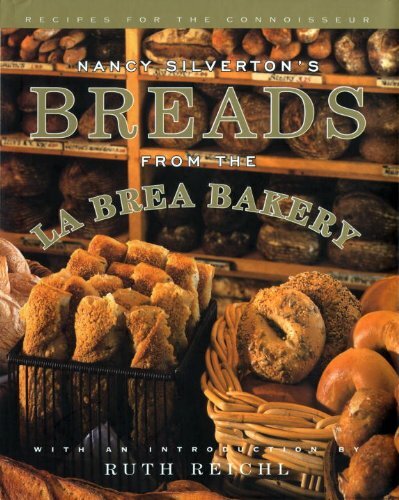 Little did Silverton know that her lesson in baking would become the nation’s top artisan bakery; on January 1, 1989, La Brea Bakery opened it’s doors in the 1500 square foot storefront bakery adjacent to Campanile. Silverton has developed hundreds of recipes, keeping the shelves stocked at La Brea Bakery. Today, as La Brea Bakery celebrates it’s 20th Anniversary, our freshly baked breads are available in 17 different countries, and maintain the same signature taste, texture, and quality that was born in on South La Brea Avenue so many years ago. In 1990, Silverton was named “Pastry Chef of the Year” by the James Beard Foundation. These days, you can still find Silverton busy creating and innovating in the kitchen. Most recently, she has completed her 7th cookbook, “A Twist of the Wrist”, released in March of 2007. In November of 2006, Silverton opened her first new restaurant since departing Campanile in 2004. Pizzeria Mozza, one half of a two-part restaurant with partners Mario Batali and Joe Bastianich, opened to rave reviews. Osteria Mozza, quickly followed in July of 2007, and was nominated as Best New Restaurant by the James Beard Foundation for that year. In 2003 Silverton was nominated as a member of Marshall Fields (now Macy’s) Culinary Council. Macy’s has since opened six La Brea Bakery café kiosks: three in Chicago, one in Detroit, and two in Minneapolis, all inspired by the Original Bakery in Los Angeles, CA opened by Silverton in 1989. Silverton has an amazing capacity for embracing the beauty of wonderful food, and will undoubtedly continue to do so for the rest of her ingredient inspired life. Each loaf, each leaf of lettuce, each lunch, is an entire world of its own waiting to be discovered, and she will never stop exploring.